Cary Gabriel Costello is a trans-man in Milwaukee. 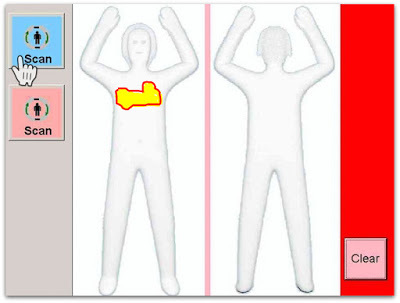 Two-thirds of the time when he flies, the TSA has a complete freakout over the "anomalies" his body displays on the full-body scanner. Costello recounts the thousand humiliations, threats, indignities and discriminations he and his wife (also a trans person) face when flying, despite the TSA's promise of "no gender-based discrimination." The new policy of making full body scans mandatory if a TSA agent doesn't like you only makes this worse. Much, much worse. The TSA may claim that trans people will be treated just like cis people by its agents, but its nondiscrimination policy conflicts with the actual practices of its agents and the functioning of the body scanners they deploy. For these reasons, things have not gotten better for those of us who are traveling while trans. The only thing that has really changed, in my experience, is that the TSA now presents itself as enlightened, and is congratulated for that--including by some LGBTI organizations. In a way, it's this that is for me the most frustrating and hurtful part of the whole situation. Trans people continue to be treated as wrongly and dangerously embodied. We continue to be pulled aside, isolated, groped, and our bodies stared at by TSA agents whose expressions often flash to that of a person smelling garbage. But we're told that everything's come up roses for us and we should dance for joy because we now live in the promised land of equality. Better to just tell it like it is. The TSA's actual policy is that people with bodies that do not conform to binary, cisgender expectations can be treated as freakish security threats. If you have a body like that, budget an hour more of time at the airport than your friends with conforming bodies set aside, or you may miss your plane. That's the real policy under which I operate whenever I fly.